I wanted to share the awesome clips from the upcoming film "It Might Get Loud" which opens in Seattle Aug. 28 at the Harvard Exit and what better way to do so than to remind you that you still have time to enter to win a movie poster autographed by the film’s director Davis Guggenheim. So watch the clips and the enter the contest. To enter for your chance to win the poster drop me an email with the subject LOUD and your name and mailing address in the body. One entry per person please. A winning entry will be chose at random and notified Aug. 19. Good luck. Have you heard Jack White’s new band Dead Weather? 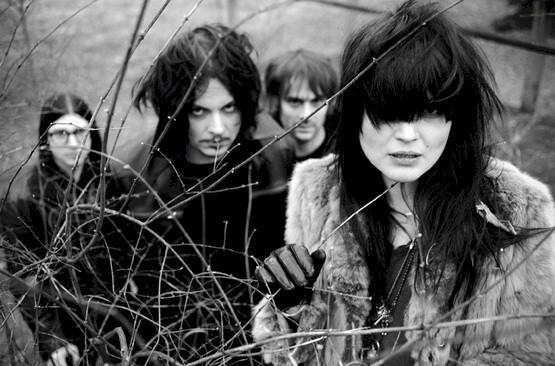 It features Alison Mosshart (of The Kills and Discount) handling vocal duties, Jack White on drums, Dean Fertita (of Queens of the Stone Age) playing guitar and Jack Lawrence (of The Raconteurs and The Greenhornes) on bass. They released their debut album “Horehound” a few months back and they will be at the Paramount Theatre Aug. 20. Tickets for the show cost $30 before taxes and service charges. But not today. You can get $10 balcony seats for Dead Weather today by clicking here and entering the password MONQUI.This is a one day only thing so jump on it while you have the chance. Also, while you have the chance, jump on this contest to enter an autographed poster for the film “It Might Get Loud” that features Jack White, Jimmy Page and The Edge. Have you heard of the film “It Might Get Loud?” It’s a documentary featuring three of the most innovative electric guitar players in rock n roll. The premise is quite simple and actually pretty genius. Talk guitars with Jack White, Jimmy Page and The Edge and then get them all in the same room together to talk shop and jam. The film opens in New York and other select markets Friday and will be coming to Seattle Aug. 28 at the Harvard Exit. For a taste of the film, check out the two clips below the jump that feature Jack White. To celebrate the film’s release, I am happy to not only share with you these two clips but also give you a chance to win something special. One lucky reader will win a movie poster autographed by the film’s director Davis Guggenheim. To enter for your chance to win the poster drop me an email with the subject LOUD and your name and mailing address in the body. One entry per person please. A winning entry will be chose at random and notified Aug. 19. Good luck.